It is a moment one almost likens to tales of the unbelievable, news about one's 50th high school reunion. When I graduated from Richmond Hill High School in 1960, it would have been the class of 1910’s turn; it would never happen to us. Now in 2010, it is our turn, my generation no longer on deck, but in the batter’s box, approaching a full count. Baseball metaphors were in my thoughts as I held the invitation to my 50th HS reunion from one of my old classmates. I had attended the 20th reunion and generally was not recognized or probably more aptly, not remembered. The surreal aspect of that gathering was it took place at the school itself, its hallways, classrooms, and the cafeteria where the reunion was celebrated, all seeming to be diminutive, as if we had either grown into giants or the rooms had shrunk. Recognizable was the old route to the high school, partially along Jamaica Avenue which connected my two childhood homes. Richmond Hill was a working class community of mostly families of German, Italian and Irish heritage. A recent Wall Street Journal article described the evolutionary changes to what used to be called 'Berlin' in the 1800s. Although still a working class community of immigrants, it is now primarily populated by families from India and Guyana. So the baton of opportunity in the New World has been passed on to a new generation of immigrants. Gone are the landmarks of my youth, in particular, Jahn’s where we spent our teenage after school time or the next door RKO Keith’s where as kids we were drawn to the Saturday matinees and the Triangle Hofbrau diagonally across the street, the restaurant where our family sometimes celebrated special occasions. My father, mother, uncle and aunts had all attended the same high school. Now they are all gone and most of the people I went to school with have migrated east to Long Island or west to New Jersey. Probably no one remains in the old neighborhood. 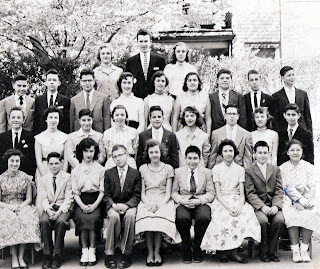 Our 8th grade graduation photo (I’m second from the right in the first row) shows us on the cusp of entering that high school, with our future selves lying before us. Now we look back and wonder how that deceptively eternal future suddenly became the past, the world of today not even imaginable then.